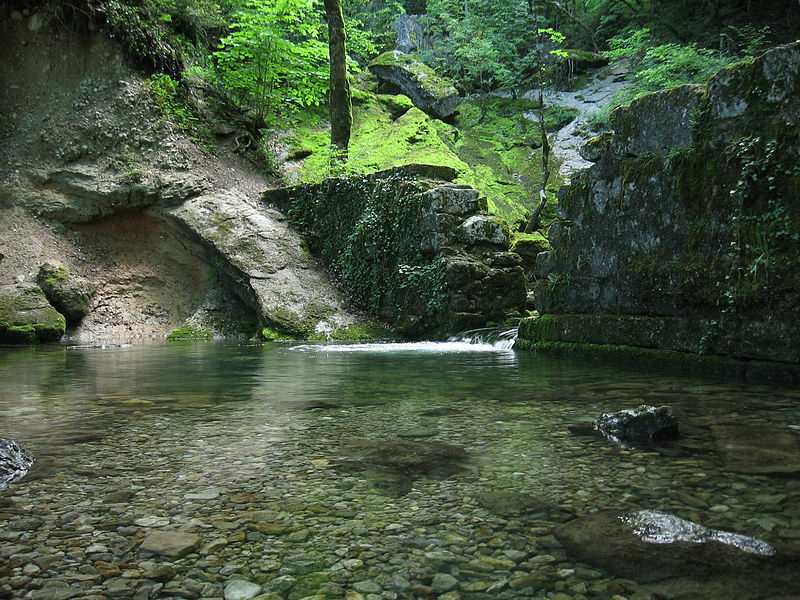 The Source d’Allondon, the head of the Allondon River in France. The ruins are of a former 19th-century mill. The Allondon River, a brief little slip as rivers go, starts as run-off from the Jura mountains, courses 22 km (14 m) through the area of France where I live, across the border into Switzerland, where it flows into the Rhône River on the Swiss side of the border before the Rhône itself flows into France. Considering its brevity, it’s quite the international traveler. On calm days I can hear it from the back of our house, and it traces part of my running path. The name is of pre-Celtic origin and means ‘water of life’. It’s also one of the sources of our drinking water, along with several reservoirs and two lakes. One of those lakes is Lake Geneva, across the border. The water supply of our region is a trans-frontier affair, automatically rendering water issues a subject of international relations and negotiations. Fortunately, thus far the French and Swiss authorities seem in agreement on local water issues and how to approach them. The proposed Gibe III hydroelectric dam in Ethiopia could size up a bit differently. The dam would be built on the River Omo in Ethiopia, which flows into Kenya, where it is the water source for Lake Turkana, the fourth largest lake in Africa and a UNESCO World Heritage site. The Omo also provides water further downstream to Egypt and Sudan. A section of the Blue Nile is diverted in May as Ethiopia prepares to construct a hydro-electric power dam. The Kenyan government states that it isn’t interested in preventing the construction of the dam, but wants to ensure that the dammed water won’t be diverted for irrigation in Ethiopia, rather than released from time to time to feed Lake Turkana. I read a reader’s comment on one of the articles. It said, “Don’t expect someone to tell us what to do with the water, it is our natural resource, we can do whatever we want. Our history show(s) that we are a nation that are willing to share our resources…” I’m assuming this was from an Ethiopian reader. If, by the luck of the geographical draw, a country is rich with water resources that would, if left unhindered, flow through other countries downstream, who owns the water? If France and Switzerland were to develop a contentious relationship, or if resources became too scarce to share, just how generously would we be willing to share the Allondon with people across the border?